We produced a complex and interesting activation for TicTac. We created a fully branded Gif Booth and also a separate activity where guests could create their own personalised TicTac boxes! 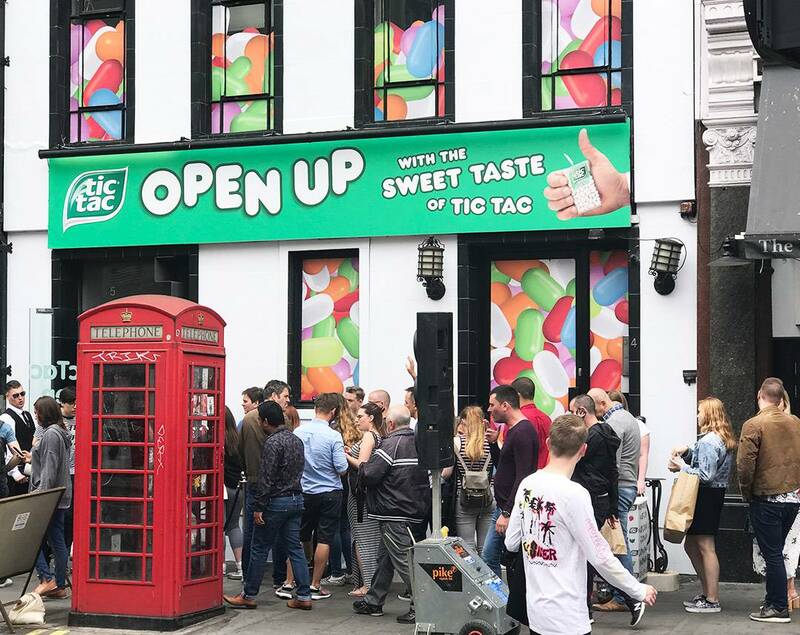 Both activities were tested on the appreciative staff at TicTac HQ, before we helped setup a pop up shop in the heart of London's Regent Street! For the Boomerang style Gifs we used a pre-printed backdrop with a Bench to recreate the Advert TicTac are currently showing on National TV. We framed the shots carefully so the hasthag on the visual display didn't appear on the finished branded GIF as we had it there as an overlay already. Everything was branded! The Mobile booth was fully wrapped from top to bottom, the startup screens were customised, and the guests received an instant link to a fully bramded microsite just by entering their mobile number or email. The guests absolutely loved the Gif booth and it was non-stop every day. We have the creation of Boomerang GIFs down to a fine art and our highly trained and personable attendants put everyone at ease and give them ideas. That's how we get such a huge spread on Social Media. If we help the guests create really innovative and unusual boomerangs they will share them and they spread! But we also have an extremely high workflow of people through the system, due to the speed of our unique sharing system. Here are some examples chosen at random from the thousands of guests who flowed through. Whilst one of our teams was running the Gif Booth activity we had a second extremely popular activation running. As guests arrived they collected an empty TicTac box, and then hit the tubes to fill the box with their choice of Tictacs. Then we produced a personailsed label for them and mounted it on the box. Here's a shot of the system we used. It looks so simple. It wasn't! Every single label was die-cut to the exact shape specified by TicTac and also had perforations on the top so the lid could flip! We had to quickly get in a second label printer and Laptop after the test day as we knew it was going to be manic. The slowest part of course was the guests making their minds up as to what to put. We helped with suggestions. We had a 20,000 word No-Go list of things that weren't allowed, and had to check every name in every language to check it wasn't actually a naughty word . Here's Gary getting ready for the morning rush! We used a dedicated label printing system for speed. Thats what we do for our clients. If they want something, we make it happen. This was an intense job so we always had three staff available, one on a break, the others working flat out and rotated them every hour to keep it fresh. The quality had to be extremely high to match the brand, and seeing the guests faces when they received their personalised TicTac boxes or their own Boomerang Gif on their phones always made it worth all the work. Here's the print system we used. As well as a continuous stream of the general public into the activation, we also had to deal with VIP guests, celebrities and paparazzi, and of course we coped extremely well as usual. It's what we do, we make it work, if anything ever goes wrong we fix it, and our presentable and professional staff make every event a joy for the client. We do all the work, take all the strain, arrive early, leave late and just keep going! Here's the most popular Gif of the activity, a Love Island star will always bring in the Social Hits!